Many people still recognize a steam cleaner to be more of a novelty than a superior home cleaning appliance. 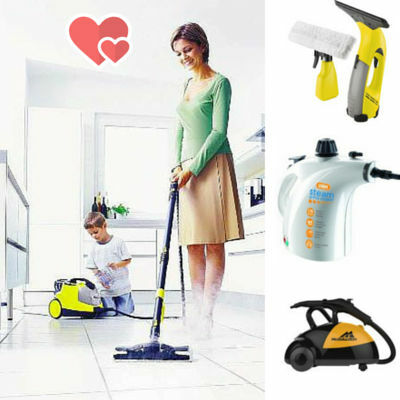 By taking a few minutes to discover more about these cleaning machines you will see for yourself just how beneficial one could be in your home. And with our best cleaners list your product selection is made easy. The best thing about cleaning with steam is that it requires no detergents or other chemicals in your home. It’s also a great choice for the environment. You can clean your floors, carpets, countertops, cooker, oven, bathroom and more without polluting the environment in any way or using harsh and unhealthy cleaning chemicals. While chemicals do an excellent job of cleaning and eliminating bacteria and germs, hot steam can match that level of efficiency. The difference with steam is that there is no chance of exposing yourself or family to these otherwise necessary and harmful cleaning chemicals. Continuous Refill: This is the ability to refill your steam cleaner while you are actively using it. This is critical for finishing big jobs. Heat-Up: Some models may take 10-15 minutes to warm up before they can be used while other more advanced models such as Vax may be ready to use in 5 minutes or less. Pressure: Many people believe that high pressure is the most important thing to consider. In reality, consistent pressure is much more important. The best steam cleaners are able to provide an even, the consistent pressure during cleaning. In our Review of the Karcher SC1020, we found if to be particularly good in this area. Volume Control: Volume control allows you to change how much steam is coming out on the fly. This makes it easier to change between surfaces depending on the level of dirt as some require more steam while others require much less. Finally, reading user reviews is important if you want to make the right choice with your purchase. Each product on our site has been hand picked because of their high customer feedback ratings and a large number of positive reviews. Shoppers looking for a steam cleaner that is efficient, hygienic and economically friendly will fall in love with the Karcher SC1020 Steam Cleaner. The steam cleaner can tackle a variety of surfaces without any additional cleaning agents. Ideal for cleaning jobs all around the home including bathrooms, kitchens, floors and more! This is not merely just a standard steam cleaner, but instead a product that can handle a variety of tasks. The Karcher SC1020 machine comes with an entirely new floor nozzle with cloth and extension tubes. This makes it much simpler to get every corner of a floor or surface and keep it clean. It also can be contorted in a variety of ways to fit under furniture or other immovable objects. The entire setup can collapse and be stored with ease. Many steam cleaners in the past ended up taking half of a closet up when not in use. The Karcher SC1020 Steam Cleaner can be tucked into most closet corners and be forgotten until it is needed again. Setup once you need it is simple and easy as well. Many users are absolutely blown away by the overall quality of the Karcher SC1020 Steamer. The thought of using a steam cleaner frequently might not be on the minds of many consumers currently without one, but once reviewers purchased it, they ended up using it quite a bit. On Amazon, two out of three reviewers give it a perfect five stars, satisfied with the price and cleaning. The Vax S4 Grime Master is a handy, compact handheld steam cleaner. It’s small enough to carry around yet powerful enough to tackle the largest cleaning jobs around your home. The accessories included provide you with everything you need to clean almost any surface in your home. The powerful steam truly makes cleanup a breeze. Read on to discover the unique features and benefits of this powerful, compact handheld steam cleaner. Window Tool: Makes the tedious job of cleaning windows inside and out quick and easy. Upholstery Tool: Easily refresh all of the upholstery and fabrics in your home to keep them clean and smelling fresh. Upholstery Tool Cloth: Get two specially fitted cloths that attach to the upholstery tool for easy cleaning. Concentration Nozzle: This allows you to spray hot steam into all those hard to reach spaces. Makes short work of the toughest dirt and grime around your home. Plastic Brush: This attachment allows you to scrub while you steam. It’s the perfect product for cleaning grout, appliances and more. Measuring Jug: Makes filling your Vax S4 Grime Master with water quick, accurate and painless. Unlike larger steam cleaners, this handheld unit heats up fast. It only takes about 2 minutes to heat up. This is crucial when it comes to taking care of big jobs. Every time you refill the tank, you’ll need to wait for the water to heat up again. Larger units can take 8-10 minutes or more which adds a lot of time to any cleaning project. Cleaning with the power of steam isn’t just powerful; it’s also environmentally friendly. When you clean with steam you don’t need to use any detergents. This is excellent for the environment and will even save you money. It’s even great for those who may suffer from allergies or sensitive skin. The revelatory Karcher WV 50 Window Cleaning Vacuum a versatile must have gadget for every home. It’s not only capable of leaving windows crystal clear but can be used for other time-consuming cleaning jobs around the home. Cleaning different surfaces around the house can be a bit tricky if you are not equipped with the right machine. In recent years, steam cleaners have become a popular way to get surfaces clean in no time. But before you buy one you should do your homework. This buying guide should help you make that decision easier. Many people do not quite understand if there is much of a different between a vacuum and a steam cleaner. While a vacuum is great to pick up smaller mess pretty quickly, a steam cleaner can do a much deeper and more thorough cleaning without taking a lot of time.